The OBDII fault code P0401 means that the engine computer has detected that the Exhaust Gas Recirculation (EGR) system flow is insufficient. The EGR system redirects a small amount of exhaust gases back into the intake. Read more how the EGR system works in this article. With this fault code, a vehicle might have some driveability issues, such as surging, lack of power, poor fuel economy, rough idle, or stalling. You might notice the engine knocking or 'pinging' noise (detonation) or there could be no symptoms at all. 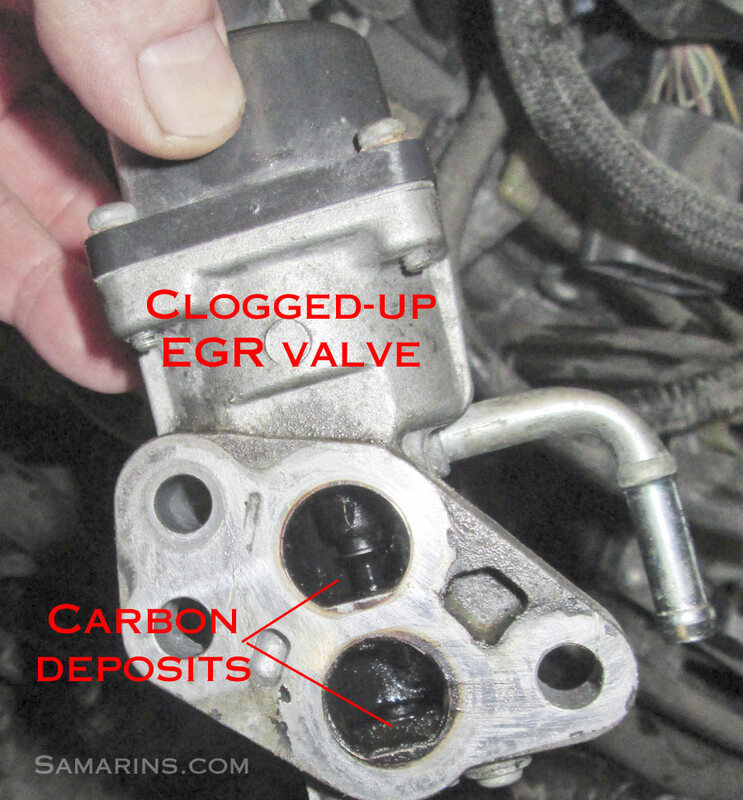 A clogged-up or sticking EGR valve is very common in many cars, SUVs and pickup trucks, see the photo. The EGR passages could be restricted too. The EGR ports in the throttle body clog up very often. Ford: One of the common problems with many Ford vehicles that can cause the trouble code P0401 is a bad or damaged DPFE sensor (DPFE stands for Delta Pressure Feedback EGR). When diagnosing the code P0401 on a Ford vehicle, the DPFE sensor and the hoses to the DPFE sensor are usually tested first. The DPFE sensor and its hoses should hold the vacuum; the hoses should not be cracked or restricted. The sensor signal voltage should change when the vacuum is applied. Sometimes the DPFE sensor hoses could be reversed during a repair and this also could cause the code P0401. Often, replacing the DPFE sensor with an updated part could solve the problem, however, other components of the EGR system also need to be checked. This thread shows EGR system components in the 2.3L Ford Ranger. If you are replacing the DPFE sensor, make sure the hoses are installed correctly and not crossed. Honda/Acura: The code P0401 is common in Honda V6 engines. A Honda service bulletin for some 1998-2001 3.0L V6 Honda Accord models describes a problem with a clogged EGR port causing the code P0401 or P1491. Another bulletin for 1999-2002 Odyssey as well as some 2003 Honda Pilot models describes the same issue with the 3.5L V6 engine causing hesitation or surge during light acceleration with the code P0401 or P1491. The repair is not easy; it involves removing the intake manifold, cleaning the EGR port, drilling out the EGR port with a special drill bit (included in the kit), installing a new EGR pipe kit and replacing the EGR valve. Some V6 Acura models also had similar issues. See some photos at this post. - Another Honda bulletin describes the problem with hesitation or stumble under light acceleration between 1,500-2,000 rpm in the 1990-1993 Accord and 1997-2001 Prelude with a 4-cylinder engine. The code P0401 is listed among other possible codes. The repair again involves cleaning the EGR ports. Toyota Camry/Corolla: In Toyota Camry with the 2.2L engine, the code P0401 was often caused by a bad VSV (Vacuum Switching Valve) for the EGR, located under the intake at the back of the engine. In many cases, replacing this VSV valve solves the problem, however the EGR passages need to be checked for restrictions and carbon buildup and the EGR valve needs to be checked for sticking. This article describes the repair procedure. A faulty VSV (Vacuum Switching Valve) for the EGR can also cause the code P0401 in older Toyota Corolla. Mazda: In many Mazda vehicles, the code P0401 could be caused by a bad EGR valve. Replacing the EGR valve with an updated part often solves the problem. The most common problems with the EGR system is a faulty EGR valve and carbon deposits restricting the EGR flow. The EGR valve needs to tested. The EGR passages need to be checked for carbon buildup and restrictions. It's easy to test an elecrtonically-controlled ERG valve with a scan tool: when the EGR valve is commanded OPEN on a scan tool with the engine idling, the engine should stumble, run rough or even stall. If commanding the EGR valve open has no effect on the engine idle, the EGR system is plugged up or the EGR valve is inoperative or stuck closed. Read more: EGR valve: problems, symptoms, testing, replacement. If there are signs of carbon buildup anywhere in the EGR system, usually the whole system needs to be cleaned thoroughly. Many mechanics recommend replacing the EGR valve as well, as even if cleaned, the valve might stick. 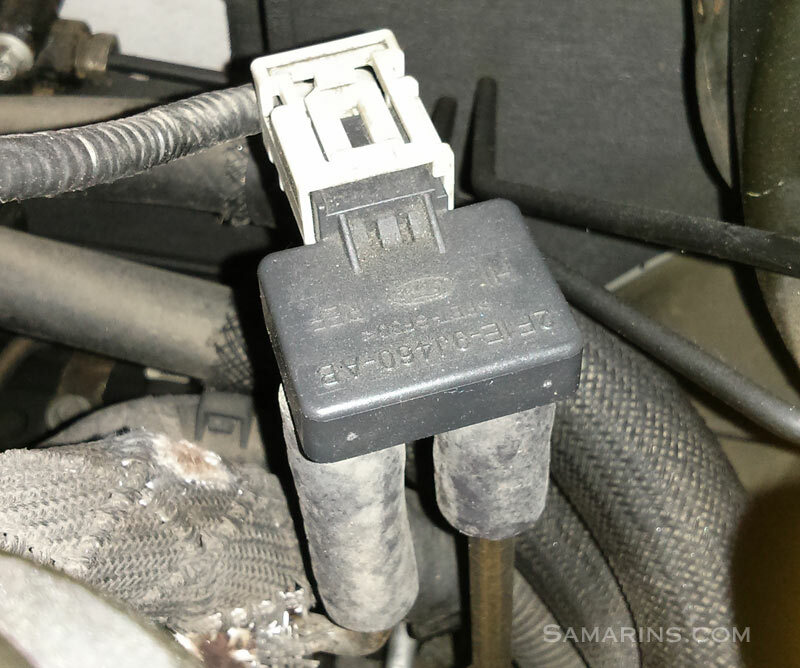 The electrical connectors and wiring at the EGR valve or sensor also needs to be checked for damage or corrosion. The EGR sensor, whether it's a DPFE sensor, EGR temperature sensor or EGR boost sensor need to be checked too. 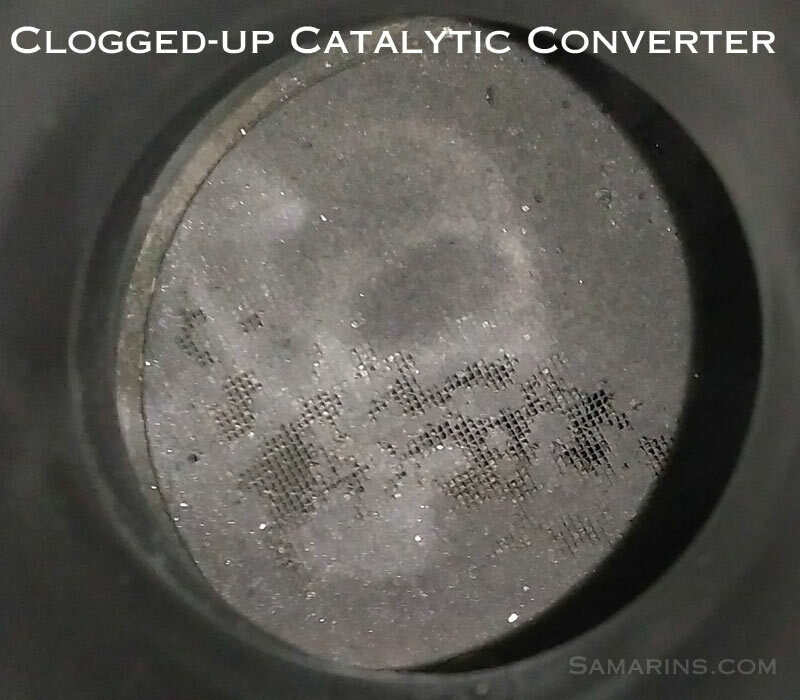 If a clogged catalytic converter is suspected, the exhaust back pressure needs to be checked.